Michaela Atanassova in Gaming Lifestyle on 17 November, 2017. Assassin’s Creed franchise celebrates its 10-year anniversary by releasing a new installment that has maintained the spirit of the AC universe but has abandoned the mistakes that kept the games struggling to keep our interest after multiple playthroughs. The first AC game offered a fresh look at the popular RPG gameplay by making stealth important to missions as it fitted the values of the story, but over the years, side-missions after Brotherhood became quite repetitive for a roleplaying game which claimed to be open world. Origins is a breath of fresh air as the maps are significantly larger than Black Flag (same developing team) and you are free to find your own style of playing as you are not constrained to play according to the storyline. The clear analogical concepts of gameplay, that are inspired by the Witcher 3, focus on the exploration factor and you are prompted to engage in side quests in order to gain additional experience and weaponry that makes smoother follow-up of the main story. The primary difference from previous AC games is the unique story of every side quest, never knowing where it will take you and what rewards you may reap or what new characters you may meet in your way with flesh stories that actually have closures. In addition, the diversity is greater – gone are the stealth tailing missions, the eagle vision and climbing viewpoints, boring competitive races remain in history, assassination missions are part of the main story but the options to complete them are numerous – you can either follow the encouragement to be stealthier or go on a killing spree with the new adrenaline meter to launch special attacks. The variety of quests has sprung from treasure hunts, commander kills which give upgradable legendary weapons; more unusual ones include escorting a massive crocodile in a swamp after he had been kidnapped by the Romans with the intention to throw him in the gladiatorial arena for sport. Of course, gladiator games combined with chariot races immerses the gamer in the typical brutality of the ancient Egyptian-Roman time of war. However, the setting itself suggests that being in that ancient period is not really that old and that the pyramids were seen as ancient even 2000 years ago, the unknown source of the hidden blade suggests its origins as ancient, visiting ruins ,surrounding a tomb, entirely built in the name of the gods, way out in the far reaching dessert – it all raises intriguing questions without answers. Despite all the mysterious and vague origins of the rituals of the Assassin’s Order, the historical environment is probably the most historically accurate from all the AC games and the immersive dynamic sandstorms, the rocky treacherous mountains and decaying shacks of common people make the open world all the more engaging – without a mini-map, of course. So how does all that connect with the Witcher 3: Wild Hunt? For starters, it is not really mission based system but more like quest-based typical for RPGs. The character, Bayek of Siwa – an elite soldier, does not want to get involved in political intrigues but is rather thrown into the twisted chain of events as he is driven by a personal agenda like revenge unlike former assassin characters with their predestined path of becoming one. Sounds familiar to the professional slayer of monsters – Geralt of Rivia from the Witcher books, whose job is to be neutral and never to take sides but gets caught up in similar political fights for power and influence. Like the Witcher, the story challenges the concepts of right and wrong, you consider the morality of those you kill but you don’t have a choice system typical for RPGs and you don’t have consequences that affect the storyline – guilt of bad choices is abandoned. Using only your compass (Elder Scrolls style) for orientation, the entirety of Egypt is ready to be discovered – military bases, giant ports, little villages, tons of temples – attention to detail rivals that of the Witcher 3 by including mythical Egyptian creatures to slay, bosses to fight – War Elephant camps recommended as the most rewarding. Hack-and-slay dynamic combat system is also reminiscent of the Witcher gameplay where you can slay an entire squad of enemies with just one pirouette, the sword fighting is focused on the right timing, switching between light and heavy attacks, parrying with a shield are all essential to protect your weak points from the more aggressive intelligent A.I. The classy RPG level-up system encourages you to loot for the right equipment that matches your skill trees so that you are ready to take on elite soldiers, trying to use their numbers against you, makes an interesting challenge. You are given the freedom to take on quests whenever you feel like it or ignore it and enjoy exploration instead to collect items. When you choose a quest, you are confined to it until you fail, succeed or simply quit. Moving too far from the objective is punishable by being in a location separated from the civilized world. As for the inventory management – the substantial gear has special traits designed for your survival, depending on tier quality, smells like the Witcher 3’s necessity to switch between steel and silver swords, we are presented with another loadout juggling challenge. The accumulated clutter of the old games is swept off into the bin as it discards some features that have become bearable and even emblematic for the franchise. The additional time to develop the game has paid off in the leanest and purest Assassin’s Creed since the series began. Honest to the point narrative, typical for the Witcher 3, with Bayek’s professional approach to slitting throats – the enemies are just names to be crossed off from his list – sets the darkest tone to date for the origins of the Assassin Order and the path of an Assassin. The playstyle encourages the player to be more improvisational without giving major guidelines and without determining for the player the relevant one in a particular dynamic situation. The gameplay doesn’t punish you for ditching stealth and it makes it entertaining as you need to figure out the best positioning, timing and movement to fit your own preferred style for pulverizing skulls. 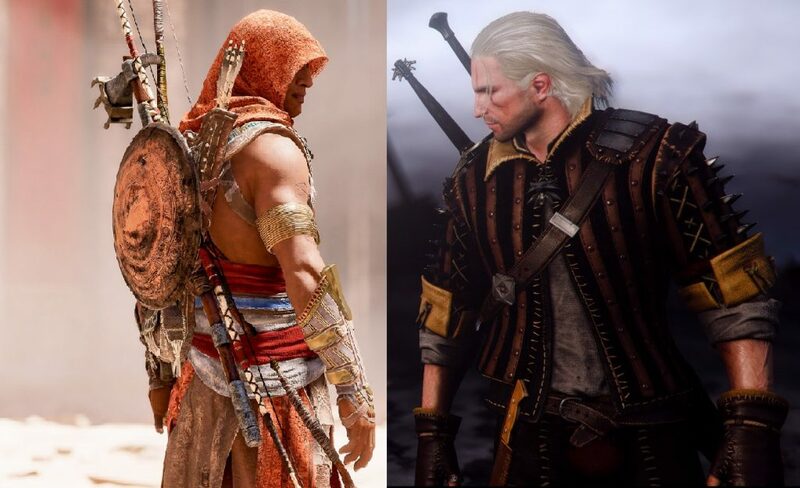 The spirit of both the Templar and Assassins is present but it isn’t named, as Bayek isn’t interested in the power struggle and just is personally motivated to avenge his son’s death. The sense of scale is not just that of space but of time as well – the historical ancientness is relative – the events are effectively accomplished in mythological meaning. Going a further step back in time, further from modern times, admitting some stealth traditions were a mistake – makes the brutality of child fatalities, of broken dynasties and downfall of Kingdoms due to political intrigues still quite easy to relate to when our civilized world is as just as full of violence. Although Assassin’s Creed Origins is a prequel – it isn’t a story about the beginning of an Order but a story about reaching a personal end. It leaves the player with the sense that the end of the AC franchise is near and that it has taken the first confident step towards that purpose.